WordPress 4.5 named “Coleman” was released just a few minutes ago. It is the first major WordPress release of 2016, and comes with some exciting new features. In this article, we will show you what’s new in WordPress 4.5, and which features you should try after updating your websites. This is a major WordPress release, and unless you are on a managed WordPress hosting service, you will have to manually initiate the update. Adding a logo to your site from customizer has been a long awaited feature. Many premium WordPress themes allowed users to set logos from theme options, but there was no standard way to do it. With WordPress 4.5, theme developers are now able to enable theme support for logo. This will allow users to set a logo for their website using the customizer. Remember it is a theme feature, which means that it needs to be defined by your theme. If a theme does not support this feature, then you will not be able to see it in customizer. Site Icons were introduced in WordPress 4.4. This feature allows users to set a favicon and application icon for their websites. WordPress 4.5 brings a slight improvement to the feature. Up till 4.4.2, you only saw the preview of site icon when setting the image. With 4.5, you also see a preview under site identity panel after you have set the site icon. Customizer in WordPress 4.5 comes with responsive live previews for desktop, tablet, and mobile devices. Simply click on the device icon to switch the view between devices. This will give you a generic idea of how your site would look on different screens. Responsive images were one of the major improvements in WordPress 4.4, which allowed WordPress to show smaller image sizes to users on smaller screens. WordPress 4.5 takes it to a new level by improving the performance of how WordPress generates image sizes. Previously, WordPress used 90 for the image quality when compressing images. Now it will use 82, which produces nearly identical images with much smaller sizes. WordPress 4.5 cleans up the comment moderation screen and makes it more usable. Until 4.4.2, when you clicked on the link in comment moderation notification email, this page didn’t allow you to edit a comment and if it also ignored plain HTML formatting used in a comment. Previously, all links added into comment content area had nofollow attribute added to them by default. WordPress 4.5 will not add nofollow attribute to links pointing to the same domain. If you or your users add link to a post or page on your site in the comment text, then WordPress will not add nofollow to it. However, if a user add your link in the URL field when submitting comment, then WordPress will add nofollow and external attributes to the link. See how you can disable website/url field in WordPress comment form. Most WordPress users spend most of their time writing content. This makes visual editor one of the most important areas in the overall WordPress user experience. WordPress 4.5 builds on some existing improvements and adds a few new ones to make writing faster and more enjoyable. One of the keyboard shortcuts in WordPress is CTRL+K (Command+K on Mac), which allows you to insert links in posts. Until 4.4.2, it opened the insert link popup which was a bit distracting. 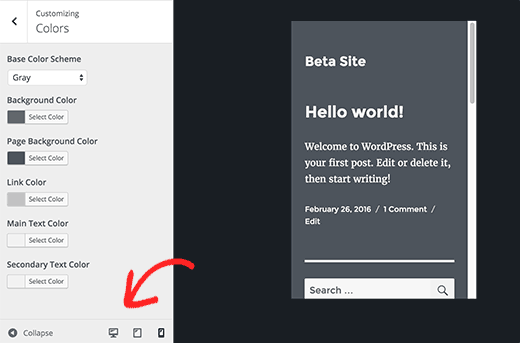 In WordPress 4.5, pressing CTRL+K shows an inline insert link menu. Simply type the URL and continue writing your post without removing hands from keyboard. Inline text shortcuts were introduced in WordPress 4.3. These shortcuts allow you to quickly add formatting markup while writing posts. WordPress 4.5 allows you to use three or more dashes — to add a horizontal line. You can also use backticks `code` to add code. 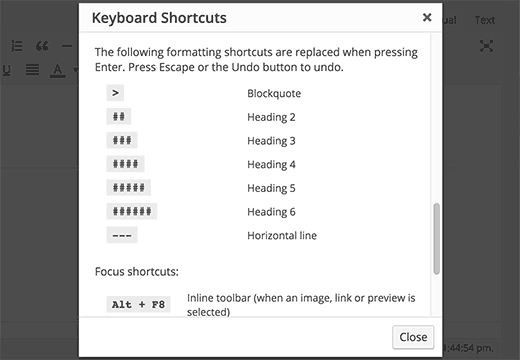 You can see a full list of shortcuts available in WordPress by clicking on the help icon in the visual editor. For those of you who don’t want to use these shortcuts, you can disable inline text shortcuts in visual editor. Many online services like Facebook, Twitter, etc. let you sign in not only by using your username but also with your email address. While you can easily forget your username, most people don’t forget their email address. 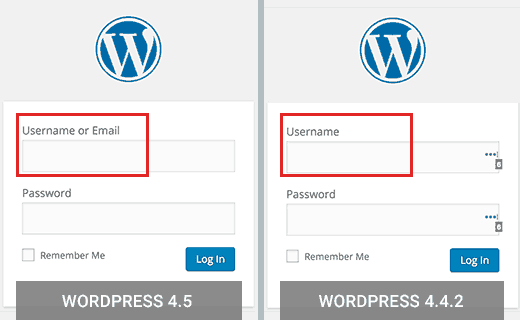 WordPress 4.5 allows users to sign in using either their username or email address as username. If you were using a plugin to allow user log in with email in WordPress, then you can safely deactivate that plugin. WordPress 4.5 also brings some exciting new improvements for developers. Updated Libraries – WordPress 4.5 comes with new versions of bundled libraries for Underscores, Backbone, jQuery, and jQuery Migrate. Selective Refresh in Customizer – Previously, some changes in customizer required entire page reload. WordPress 4.5 comes with a framework to allow selective refresh in the customizer. It is fast and will allow developers to do great things with live previews. (#27355). 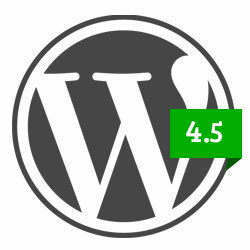 We hope this article gave you a good overview of what’s new in WordPress 4.5. We are particularly excited about optimized image generation and embed templates. What are you excited about?